The DR-200CE brings the classic dreadnought style and sound with a beautiful cutaway to pros and beginners alike with tone and build quality that first time players and professionals expect to hear when they buy an Epiphone. The dreadnought style is the classic go-to shape for bluegrass, folk, rock, country, and everything in-between. The dreadnought sound is commanding when required but it’s also balanced which means that at any volume, you can be heard clearly and hear yourself well, too. Many guitars claim to be a “classic dreadnought” but only an Epiphone comes with a Limited Lifetime Guarantee and Gibson 24/7/365 customer service and a century’s worth of experience. Visit your Authorized Epiphone Dealer today and pick up a DR-200CE. The DR-200CE features a Select Spruce top. Spruce is one of the finer tonewoods with a rich complex tone that begins to breath and improve with age the more its played. So play the DR-200CE as much as you can! The DR-200CE body is made from Select mahogany and the bridge is made from rosewood. A guitar endures great stress guitar between the nut and bridge and rosewood has proven to be both long lasting and a perfect compliment to a Spruce Top. The classic black vintage style pickguard is easy to spot on stage or across the room and has the iconic "Epiphone" E.
The DR-200CE is now updated with Epiphone's eSonic™ preamp and NanoFlex™ pickup system. 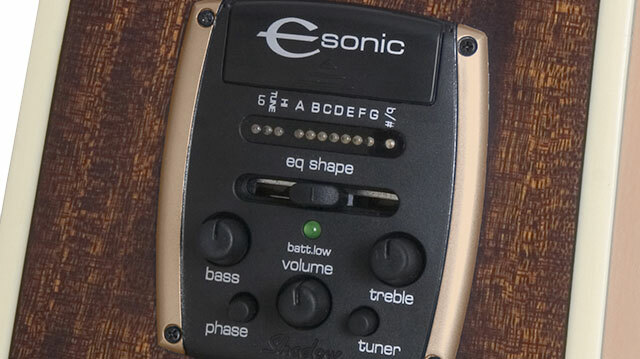 Made in cooperation with Shadow Germany, the new eSonic preamp features a built-in, easy- to-use tuner. When engaged, the guitar's output is automatically muted with no "popping" noise, making it a perfect choice for stage use. You can even push in the "tuner" button and unplug the guitar without a loud "pop." Other controls on this state-of-the-art preamp include Master Volume, Bass, Treble, EQ Shape, Low Battery indicator and a Phase switch to help eliminate unwanted feedback. The preamp uses two 2032 lithium watch batteries that are not only lightweight, but provide significantly longer life than old-fashioned, heavy 9V batteries. Under the PR-5E's compensated saddle is Shadow's proprietary NanoFlex™ low-impedance pickup. 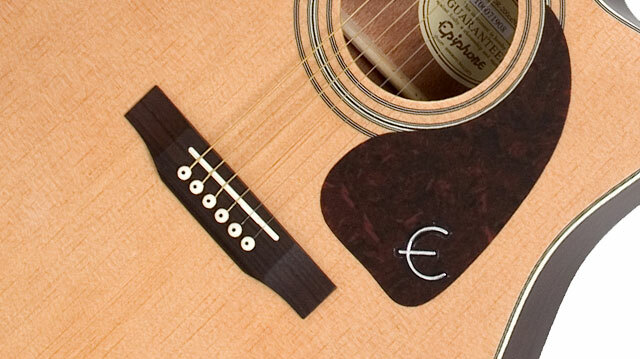 This unique flexible sensing material features integrated active electronics and picks up not only string vibration but also top and body vibrations as well for a truly acoustic tone without the harshness of piezos. The DR-200CE's mahogany neck is glued-in at the 14th fret and features a 25.5" scale, a SlimTaper™ shape, and a rosewood fingerboard with dot inlays. Our iconic Sloped Dovewing headstock completes the look with die-cast premium tuners. 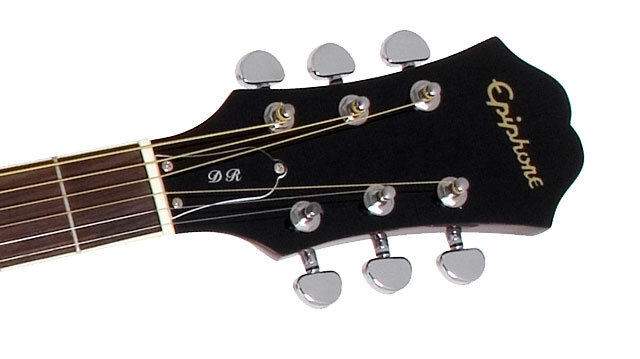 The DR220CE is available in Natural (NA).